Like in the last 5 years, the Meeting C++ conference is looking for companies willing to support the conference through sponsoring! There is also the limited option of presenting your company at the conference with a booth! Finally all talks for Meeting C++ 2016 are published! Meeting C++ conference in this year: 2 Keynotes (Bjarne Stroustrup & Louis Dionne), 33 Talks & 2 lightning talk sessions. 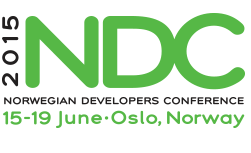 There was a lot of interest for the very strong C++ track that we hosted at the NDC conference in Oslo last summer. Here is a brief summary of the event, including links to the videos we recorded. We are repeating the success this year, June 17-19. A few big C++ names has already been signed up, but there is still available slots in the agenda. If you would like to be part of the C++ track this year, please submit your proposal soon. The CFP closes February 15.